This is the kind of thing you only have time for when you’re lying on your back with an injury. Well, I’m not quite lying on my back, but there’s only so much internet browsing you can do, before you lose the will to live. So this is a recap of results from 2013 and a look forward to 2014. Before the hill climb season, a few things stood out. Buxton Mt TT 1st and getting close to Stuart Dangerfield’s course record. I also set a pb for 100 miles in the national 100, up in Lake District. It was a good honest course, and 5th sounds pretty good, even if some of the fast guys were chasing faster courses down south for the BBAR. I also enjoyed doing the National 50 down in Wales, where I finished 9th. I think this is the first year, I’ve done 3 Nationals in the same year. I hope to do more next year. I also set a pb at 10 miles, though it was a case of shaving off a few seconds (19.02) on the superfast V718- course, at the end of the M65. I did a total of 10,570 miles during 2013. The biggest month was June – 1,263. The shortest distance was Feb – 412. There were 717 miles done in races. I don’t want to calculate how many miles I did driving to races. I should just be grateful to my parents’ B&B up in Yorkshire. The stand out target for 2014 is to retain the National hill climb title on Pea Royd Lane. I think it is possible, though perhaps a little more difficult than the Stang. Setting course records on Leith Hill (3.33) and Guise Edge (3.23) is encouraging in that I reckon the winning time in 2014 will be around that mark. I would love to have another go at Horseshoe Pass, I was 13 seconds off the course record – that would be a special one to get. The other big target for 2014 will be to have a go (injuries permitting) at the BBAR competition. This is a long standing competition which involves getting the best time and average speed at 50 miles, 100 miles, 12 hour. I enjoyed the 50 and 100 miles this year, and am really looking forward to (finally) having a go at a 12 hour. I will also try to do the National 50, National 100 and National 25. I think it’s quite possible to improve on last year’s positions. I was definitely getting faster towards the end of the season. 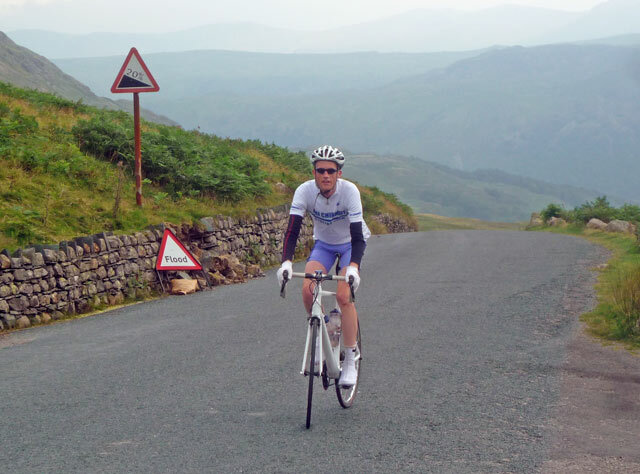 Apart from racing, I have very few goals, though I will continue to tick off any hard hill climbs in the 100 hill climb books, I have a trip to Great Dun Fell (Knock, Lake District) lined up. and I’ve even toyed with another trip down to Box Hill. Belated but well deserved congratulations on winning the national hill climb. All the best for 2014 Tejvan, looking at a trip to Great Dunn Fell myself soon, be sure to let us now how you get on. that’s a shame a tough choice. Just a quick question about H10/181, have you ever done a training ride on the course and what provisions are taken to ensure the safety of the riders during the event (I do apologizes if this sounds like a bit alarmist)? I have never done a official time trial like this on a road like the a40 and would have no idea what to expect. It’s fairly basic dual carriegway. Course is very straight forward. I wouldn’t really recommend practising on the A40, unless it is a quiet time. Traffic volumes can get heavy. In the race, there will be warning signs alerting drivers to the fact that riders will be on the road, but that’s about it. Once you start riding it feels better than standing by the side of the road looking at the traffic go past. Good luck.